If you’ve never been scammed before, it’s very easy to look at someone else who has been and be ever so slightly judgmental, because of course, 'it will never happen to me'. Strangely enough though, everybody who’s ever been scammed - or come close - thought the very same thing before it happened to them. It’s a very well-known cliché, but the most simple and effective advice when it comes to buying a used car is that 'if it looks too good to be true, it probably is.' The Metropolitan Police has this advice: "Do not let the excitement of buying or selling a vehicle compromise your safety or that of your money." Sadly, not all scams are based on luring in potential victims with barely believable offers that are fairly easy to spot. The following covers some of most common types of scam doing the rounds, although there are plenty of variations of each. We’ve outlined not only what they are and how they work, but in each case what you should look out for to avoid being ripped off yourself. The virtual vehicle scam is one of the most popular type of used car scams, so called because the car you’re trying to buy doesn’t exist for sale and the ad has been cloned from elsewhere. The virtual vehicle scam usually involves placement of an online advertisement in one of the most popular trade sites and the sole purpose is to extract money fraudulently from an eager buyer. In most cases, the advert will entice a buyer by advertising an in-demand make and model of car, with below average mileage and a slightly below average price tag – because scammers have learned that ‘too good to be true’ doesn’t fool many these days. An advert is placed online, often cloned from a legitimate source and using a car that is HPI clear, but the seller asks anyone interested to contact them directly via email, thus avoiding the safe contact methods offered by most classified sites. The scammer will make it appear that the car is being sold by a car dealer, yet the associated phone number will go to voicemail and a personal email address is supplied to contact instead. Once the scammer has opened up email dialogue, he or she will attempt to extract a large deposit, in various ways but always prior to the buyer actually seeing the car. Whichever way the scammer asks for payment, and whatever the premise, it always involves giving your bank or credit card details out. Any amount from a small holding deposit to the full amount of the car, totalling thousands, can be extracted from the victim. Once equipped with your bank or credit card details, a scammer can empty your accounts. And of course, the car will never turn up. Always be wary of any car being sold with an associated story – usually about leaving the country imminently - which is the reason for the cheap price. Never, ever transfer any money to anyone – no matter how pleasant they seem or legitimate their company seems – without having seen the car first. Put yourself in the shoes of the seller: would you offer a complete stranger a massive bargain? Or ask them for half the money up front? Unless you’ve seen it and/or know the seller, never buy a car that’s being sold from overseas – this is a classic scammer’s way of avoiding a viewing. Ultimately, buy from a reputable car dealer for complete safety: the guarantees you get far outweigh the few hundred pounds you might save buying privately. Modern cars are getting harder to clock - yet the number of cars with mileage discrepancies is on the rise. Changing a car’s mileage to increase its value is one of the oldest tricks in the book. It is, of course, illegal to falsify a car’s mileage, but it’s also illegal for a seller to fail to check that the mileage of a car they’re selling is correct, under the terms of the UK Consumer Protection from Unfair Trading regulations. The seller will remove the instrument binnacle of the car and alter the odometer, or more typically with modern cars, use software to perform the same task. The car is then sold under false pretences, often with false documents created to give the impression of a full, clean – and much shorter – service and MoT history. Some will even go as far as to change the pedal rubbers and gear knob – tell tale signs of true the age of a car. A clocked car, aside from being worth more to the seller, will inevitably be hiding a myriad problems associated with any high-mileage, older car. It could be that a private seller is simply trying to make more money, although more often that not, clocking is hiding some more serious issues – which may not present themselves until the new owner has bought it. It’s likely that a clocked car has also had its warning lights switched off during the process. An HPI check using the car’s registration should confirm the mileage of a car, and any car with a full service history will have its service book stamped with the mileages. Get an HPI check and don’t touch anything that looks suspicious. A dealer or seller may try to fob you off in vague terms about “inconsistencies” but if it doesn’t seem legitimate, walk away. Check the car itself for wear and tear consistent with the claimed mileage: if the steering wheel, gear knob and pedals are very worn – or brand new – this is suspicious. Buy from a reputable, known dealer, which is highly unlikely to ruin its reputation for a few hundred extra pounds. Buy a car check from the AA. It may seem expensive, but it’s well worth it for peace of mind. If you do think you’ve bought a car that’s clocked, contact the Citizen’s Advice Bureau www.adviceguide.org.uk - you’re entitled to a full refund. Can I check a car's MoT and mileage history for free? All you need is the vehicle's registration number which means you can check online before you travel to see the car. If the registration is covered up in photographs, contact the seller and ask for it. If they seem reluctant then this should set alarm bells ringing. It will give you all the basic information such when it was first registered. More usefully, it will tell you if the car is subject to a statutory off road notice (SORN), plus if it has a valid MoT and when it expires. 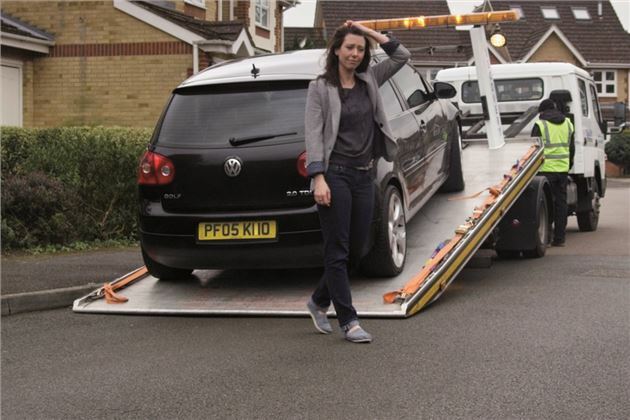 Any car that is SORN'd should not be on the road as it may not have an MoT and it won’t be taxed. What other car history check searches can I do for free? If you have the time, you can also fill in a V888 request form and send it to the DVLA to find out information about the registered keeper of a car. This will give you the registered keeper’s details and those of previous owners, which again helps you establish a fuller picture of the car’s background. You can also request information the DVLA may hold about you if you are about to sell a car and want a clean bill of health for any buyer carrying out these checks. Where can I get a car history check from? There are many companies offering car history data checks and we’d recommend using one, even if a used car seller says this has already been carried out. Better to spend a few pounds and be safe than sorry – and checks can be carried out online, via mobile phone or by apps on tablet PCs. My Car Check has gone from new kid on the block to established car (and other vehicle) history check provider in little under 15 years. The firm - which may still be unfamiliar to come buyers - now performs more than 1m look-ups every day. It's one of the cheapest on the market, with £1.99 and £9.99 history check options. The basic check will tell you if it's stolen, exported, a write-off, scrapped, its vehicle details, a valuation and MoT status and history. Go for the full check and you'll get a report into the vehicle's finance history and a £30,000 guarantee. How much does a My Car Check Car report cost? There are three levels of pricing for My Car Check, including - unusually in this market - a free option. This checks the vehicle's details, MoT history and gives a valuation. The basic level of history check is £1.99 and the full service option is £9.99. There is no further discount for multiple checks. The AA's History check includes whether the vehicle is an insurance write-off, the number of previous owners, whether it's recorded as stiolen, has outstanding finance, mileage discrepencies, logbook check, whether it has been imported or exported, number of number plate changes and whether the vehicle is recorded as scrap. How much does an AA Car History Check cost? Pricing for The AA's Car History check is very simple - it's £14.99. The AA does offer a discount on its history checks if you're buying in bulk (for instance if you're looking at several cars before making an offer). For £29.99, you can have six checks, which works out at £6 per check. HPI is the best-known vehicle history check companies - so much so that "HPI check" has become the generic term for checking a car's background. There are two levels of cover: basic and the full HPI check. The basic service will tell you whether it has finance outstanding, has been stolen or written-off and has been exported/imported. The full HPI check has a £30,000 guarantee and adds: finance agreement details, mileage discrepancies, MoT history, write-off details, number of previous owners, CO2, Vehicle Tax info, stolen Logbook check, if it's recorded as scrapped, market valuation, past/future values and full plate change history. HPI offers a clone check on its full HPI check service. How much does an HPI History Check cost? There are two levels of pricing for an HPI car history check - £9.99 for the basic service and £19.99 for the full HPI check. As with other vehicle history check providers, there's a discount on offer for multiple checks. HPI charges £29.97 for three checks that can be redeemed within three years. Also called ‘vehicle matching’ scams, a legitimate seller who’s placed an advert for their car will be contacted by someone claiming to have a buyer waiting for them – who they’ll ‘match’ with your car for a finder’s fee, typically between £80 and £100. They’ll reassure you that you’ll be refunded if the sale doesn’t happen, making it ostensibly win-win. Until, that is, the ‘buyer’ transpires to be a figment of someone’s imagination. And the cold caller disappears without trace. By preying on the natural eagerness of a car seller to make a sale, the cold caller makes the fake ‘buyer’ seem very enticing, making up all sorts of details about him or her. In the spirit of all the most successful salespeople, the caller will try to charm the seller into parting with what seems like a relatively minor sum in order to make a sale. According to the Office of Fair Trading, car buying scams cost the British consumer £3m per year at its peak, with thousands scammed, although following a crackdown by the police in 2009 it’s less prevalent – but not entirely eradicated. Aside from the money loss, the scammer is also given access to your bank details, which leads to the possibility of a criminally depleted bank account. Your details could also be sold to another equally sinister third party. Never give money to anyone that’s cold called you. Don’t give out your credit card details to anyone either. You may be protected from fraudulent transactions, but that doesn’t stop your details being sold and/or used elsewhere. As yourself why any legitimate buyer would become involved with a vehicle matching company, rather than just looking for a car themselves? Callers are trained in high-pressure selling techniques – don’t be fooled. If you are called this way, take as many details as you can about the person and company involved, and report them to Action Fraud. Someone from the Channel Islands wants to buy my car from the UK - is this a scam? I'm selling privately and had an offer from someone in the Channel Islands. The buyer is not coming over in person, they just want to send a shipping company. I'm concerned with payment over to UK and how do they sign the V5C? This has the hallmarks of a classic scam. You lose your money and you lose your car. But if the purchaser pays you by cheque, once that cheque has cleared and several more days have passed (total 7 days from paying it in), then the cheque cannot be revoked and is a safer means of taking payment than by bank draft or transfer because they can be revoked after the event. You are correct that the new keeper has to sign the V5C, so that will become a matter of trust between you once the money is irrevocably received. Keep a photocopy of the V5C that you send him and then check with the DVLA that he has send the form to them. As with all these things, the target is your money and the shady buyer scam can get this in a couple of ways – most commonly by a fake ‘overpayment’ and occasionally by starting a payment dispute after collecting your car. One common way is that a buyer will email you claiming to desperately want the car – so much so that they’re willing to transfer the money via an online payment service. They’ll typically claim they’re working overseas, but that they have a company that will pick up the car for them. They’ll transfer the money – often from a stolen credit card or using a bogus online payment account – then email you to claim they’ve 'accidentally overpaid' before asking you for a refund of the difference. You oblige, but then the buyer withdraws the original payment, leaving you out of pocket for the legitimate money you sent for the ‘overpayment’. A less common but even more sinister ploy is also played out using money transfer services, taking advantage of the buyer protection they provide. A fraudulent buyer will collect your car, having transferred the money, but after driving it away will begin a payment dispute with the transfer service, claiming they didn’t get the car, and demanding a refund. In rare cases, you lose the money and your car, and the buyer is never seen again. Leading online payment service PayPal recommends you never transfer money to anyone you don’t know after an alleged overpayment. See it’s help page for details. Similarly, the Metropolitan Police and Western Union Bank also advise not to engage in large transfers for goods with anyone you don’t know. Don’t deal with anyone that claims, for whatever reason, they can’t come and see your car – “I’m working abroad” and “I’ve just moved” are two common excuses. Ask yourself why anyone would buy anything as expensive as a car sight unseen? Cancel any transaction that involves an overpayment – who would be careless enough to do that? The Government requires that photocard licence holders renew their licence every 10 years, for a £20 fee, or face a fine of up to £1000. This can be done by going to a Post Office, but for those too busy, both the Post Office and the DVLA offer an online renewal service. Scammers use this fact to create fake sites that look like the real thing, whose sole purpose is to extract money from you. The website www.dvla-driving-licence.co.uk was one such fraud site, though it has since been seized by the Government. However, that won’t stop the same group (or others) setting up more false site using a similar domain. The person looking to renew is directed to an on-screen form in which they’re asked to declare all manner of personal details, many completely irrelevant but designed to add a sheen of veracity to the scam – like asking which internal organs you’d like to donate in the event of an accident. This is among information being requested that’s more financially useful to a scammer, including your passport number, telephone number, address and national insurance number. A card payment is then taken. The scammer then emails you claiming the payment has been rejected. They will instead request you provide an account number and sort code so that it can be processed. Aside from not actually receiving a new licence, running the risk that your existing one will expire, plus losing the initial card payment, the scammer now has everything he or she needs to clone your identity – and, if you hand over your bank details subsequently, empty your account. At best you’ll lose a £100 payment and have to re-apply through the proper channels, but you could end up the victim of identity theft, have your bank account emptied and have someone engage in criminal activity on your behalf. This scam also applies to those looking to renew their vehicle tax online. It is often linked to groups running similar scams involving non-motoring matters – visa applications and such like. Renew your licence by physically going to a Post Office. Your picture will be taken, your forms processed and your payment taken safely. Be wary of any website that asks for very detailed or superfluous information, such as the length of time you’ve lived at your house, or your mother’s maiden name. Never enter your bank account details to anyone, either online or via email. If you suspect online fraud, pick up the phone and talk to someone – a legitimate operation will always be contactable by phone. As modern cars have become more resistant to crude identity changes, criminals have found other ways to disguise a car’s identity and cloning is one of the most popular. It involves applying an apparently honest identity to another car, which is usually stolen. By swapping the number plates, registration document and even the VIN (vehicle identification number), a criminal will try to convince you the car is genuine. Some sellers will also try to clone a car if there is outstanding finance owed on it or if there are large fines attached to the car that they are unwilling pay. A more extreme version of a cloned car is the cut ’n’ shut, where a car has been created from two or more separate cars. Not only is this illegal, it’s very dangerous as the car will not be structurally sound in the event of an accident. Unfortunately, if you end up buying a cloned car then you will lose both the vehicle and your money. The police will seize your car as a stolen vehicle while the 'seller' will be long gone with your cash. Getting any money back via your insurance firm could be a long and fruitless effort. To spot a cloned car, carry out a car data history check to make sure all of its details are correct, including colour, engine size and date of first registration. Also look for signs for any tampering with the number plates, V5 registration document, service history and VIN. The car should be at the address that's listed on the V5. The seller should also provide ID in the form of a photo card driving licence and utility bill to prove they are the person named on the V5. If they can't or the address doesn't match, walk away. Cut ’n’ shut cars are created to hide the identity of damaged cars that shouldn’t be on the road. Look for signs of poor panel gaps and badly aligned panels, different shades of paint and cars being sold for much less than they should cost. Ensure the car’s registration document, mileage, MoTs and service records all tally with the DVLA and a car history check. Many cut ’n’ shut cars are insurance write-offs that should not be on the road. If the number plates on your car are stolen then report it to the police using the 101 number immediately. It may just be vandalism, but it's better to be safe than sorry. Criminals won't always physically take your number plates though. If you begin to receive parking fines or penalty charge notices for locations you've not been to, tell the DVLA. Return the fines to the issuing forces/authorities with evidence and an explanation. I have found a cheap car - is this too good to be true? I've seen a car advertised via a well known classifieds website. The price is attractive. Very attractive. The seller says her job has moved to USA and she is in New York, hence the reason for the sale, and the attractive price. The sale is being handled by a company on her behalf. It all sounds very credible and her email responses appear to be honest. The correspondence on how the transaction works seems believable But you never know.... Is this too good to be true? The simple answer is, as always, if something looks to good to be true, it isn't true. Nobody ever gives anything away unless they have to. Whenever a transaction is overly complicated, treat it as a potential scam. Crash for cash scams are on the increase in the UK, costing the insurance industry more than £300m a year. And those costs are passed onto you - it's why your insurance premiums are on the rise. It's now the most common kind of motoring insurance fraud, with criminals targetting private motorists as well as commercial vehicles, particularly HGVs. You're driving along a dual carriageway when someone overtakes. They pull in and slow down, but the car in front of them suddenly brakes. They perform an emergency stop and you, unable to take evasive action, collide with the back of their car. The first car then drives off, the driver seemingly oblivious to the accident they have just caused. It may all seem like an unfortunate accident but it has in fact all been staged by the two other cars. Chances are there will also conveniently be a witness nearby, who of course is part of the scam. It's known as an 'induced accident'. When a vehicle crashes into the back of another, it's normally the driver of the car behind that's at fault. So staging these accidents, means you'll be the one at blame, despite it being deliberately set-up. It can happen anywhere too. Another car may pull out in front of you, slow down briefly, accelerate and then brake suddenly. The other common one is a car moving normally away from traffic lights or a roundabout, only to hit the brakes for no reason. Or stopping suddenly at a pedestrian crossing, even though it's clear. Another variation is the 'flash for cash' scam. While you're waiting to pull out of a junction or off a slip road, a car will flash its lights to let you out. Only to then accelerate and crash into you, claiming they never flashed their lights and that you just pulled out in front of them. Criminal crash for cash gangs target vehicles that they know will be insured and have drivers who they can intimidate. That means older drivers, mums with their children in the back and well-maintained newer cars. While the accident itself can be scary and stressful, the scam part really comes into its own with the insurance claim afterwards. The criminals will make exaggerated claims for damage to the vehicle, personal injury, replacement vehicle hire, loss of earnings and anything else they can get away with. A successful scam can net the criminals anything from £20,000 to £40,000. It will result in you losing your no claims bonus and paying more for your car insurance when it comes up for renewal. Get a dashcam. If you are unfortunate to be involved in this sort of crash, dashcam footage will be invaluable in proving you've been a victim of a scam. You can get a half-decent one for just £20. If you have an accident and it seems suspicious, call the police. Don't admit liability and get the details of any witnesses. If you can find dashcam footage from other drivers, that's even better. Be wary of cars driving in an unusual manner. Fraudsters want you to be close enough so that a collision is unavoidable. They will suddenly slow down or speed up erratically, hoping that you get frustrated. Don't follow the car in front too closely. Remember your braking distances so that if someone in front does stop suddenly, so can you without hitting them. Be wary if you spot a driver paying a lot of attention to the car behind and checking in their mirror repeatedlty. Similarly, look out for passengers who are doing the same. Car dealers and private sellers must both abide by the law, but some unscrupulous dealers will pose as a private seller to avoid their legal commitments. A dealer must tell you about any faults with the car by law and provide a three month warranty. A private seller is not obliged to do either of these things, though they cannot lie to you because the Sale of Goods Act gives you protection against this. A dishonest dealer will ask you to meet them somewhere neutral, such as a supermarket car park. If they are not willing to show you the car at their home address, you should ask why and be suspicious. A history data check may not show up a dealer as a registered keeper, but asking about the car’s history and service record should show up any inconsistencies. One of the oldest tricks on the book when phoning up about a used car is to say: ‘I’m phoning about the car for sale.’ A private seller is unlikely to have more than one car for sale, while a dealer will have several. Dishonest dealers may have a mobile phone specifically for each car they are selling so they know which car you are asking about. If you buy a used car and something goes wrong, you won't have the same level of comeback against the seller. The law is different for private sales and does not provide the same level of protection for buyers compared to those who buy from a dealer. It means you could end up with a car that's faulty and no warranty. Trying to get the car repaired or obtaining a refund can involve a lengthy legal battle. Ask lots of questions about the car’s background and history. How long they have owned it, why are they selling, when was it last MoT’d and serviced, how worn are the tyres are, etc. A real private seller will know the answers off the top of their head. When you view the car, check the last registered keeper is the person selling the car. Some sellers will say they are selling the car on behalf of a friend or relative. If that’s the case, ask to speak to that person and ask why they are not selling for themselves. While some scams are as old as time, scammers are using ever more sophisticated methods to dupe even the most cynical, savvy buyers. Read our tips on staying safe when buying a car. …it almost certainly is. You probably don’t need us to tell you the oldest adage in the book, but this really is the golden rule when it comes to buying a car. Too-good-to-be-true offers are very, very rarely benevolently motivated. Think about it this way: would you offer your car to a stranger for less than its market value? Knowing the market is the only way to know if something is too good to be true. Once you’ve established what you need from your car, and what your budget is, do plenty of looking around, both online and at dealerships, to see what’s available. Cars of a similar type, age and mileage will fit into a similar price bracket. If there’s something specific you’ve seen, check the price using the vehicle registration and our pricing tool. The 2015 Consumer Rights Act requires that any dealer or trader provides clear and honest information about the car before you buy. The law stipulates that it must be fit for purpose and of satisfactory quality. The act also gives you the statutory right to reject a used car within 30 days of purchase from a trader/dealer if any fault is found. Equally, the Misrepresentation Act 1967 obliges private sellers to describe accurately what they’re selling – if that hasn’t been the case, you can claim against an individual too. However, be wary of unscrupulous dealers who may try to pretend to be a private seller in order to off-load sub-standard old bangers. The aim of many fraudsters is to have you part with your money without ever seeing a car – because the car doesn’t exist. It’s a simple rule: never buy a car, or place a deposit on a car, or give any money to any person or organisation pertaining to a car, without having seen the thing in real life first. And when viewing for a private sale, insist on seeing the car at the seller’s address – where the car should be registered. With the car in front of you, it’s essential to do the proper document and identification checks, no matter what excuse a seller may have for not having them. All cars should have a watermarked V5C document, which should match the car’s VRM (its registration) and its VIN (vehicle identification number), which will often be displayed at the bottom of the windscreen. The V5C should also show that the car is registered to owner’s address. If it doesn’t, ask why. The DVLA has plenty of advice on the V5C here. Aside from the V5C, a used car should always have two keys and a fully stamped service history, along with the manuals. In particular, never buy a car with unusual gaps in the service history, which could be a sign the car has had its mileage tampered with. And of course make sure that any car over three years old has a valid MoT. A vehicle history check can cost less than a London pint, and it could be the best money you’ve ever spent. A history check will search the DVLA, police and Association of British Insurers records to discover if the car has ever been stolen, involved in an accident, or has outstanding finance against it. Outstanding finance needn’t be an issue if the seller is open about it and a price can be agreed that includes it, but be sure to speak to the finance company before agreeing a sale. Any legitimate private seller will have no problem with a buyer having the car inspected by a professional. And for around £150 you can ensure (as far as possible) that the car you’re buying is sound. This is not a guarantee, of course, but it should go some way to reassuring you. With the AA’s service, the results are usually given the same day, so don’t let a seller pressure you with the old “I’ve had lots of interest and the car will be sold in an hour,” shtick. Your insurance company will cover you for a test drive - you should insist on one before parting with your cash. At the very least, go for an extended run with the owner in the drivers’ seat – and use the opportunity to really poke around the car. Listen for any unwanted rattes or odd noises. Take in a variety of roads and speeds. And if you’re not confident enough to decipher when there’s a problem, find a friend who knows a little more and take them with you. Cash at the site of the sale is the best way to pay for a car sold privately, though for obvious reasons it’s not wise to declare to a seller that you’ve not met that you’ll be turning up to buy a car you’ve not seen with an envelope full of notes. If you’re comfortable with a seller, having met them, agree to return later with cash, or better still, go to the bank with them and do a transfer. With a dealership, often a finance payment is the best way to go, because it not only means the dealership is liable if things go awry with the car, but the finance company is too. Is this car too good to be true - it feels like a scam? I have seen a Porsche 911 advertised online which is considerably cheaper than most others particularly for the age. Although advertised as being for sale in England on contacting the seller within a very short time after the advert appeared they have said they took it abroad when returning from working in the UK. They have offered to ship it wherever I want and suggested Amazon Payment which they say will give me five days to view the car before accepting or rejecting it. Given the nature of these cars I was thinking of having it independent inspected by a specialist garage anyway so could get it shipped there. My requests for information about the history of the car haven't really been answered in any detail as I would expect someone who has this type of car to do. I can't help feeling that something isn't quite right about it all. Am I right to be concerned? This is a standard scam designed to ensnare the 'something for nothing' brigade. Nothing is ever cheaper than the market norm unless its a bereavement sale or the vendor is desperate. Anything complicated (like this) is always a scam. If it's too good to be true it isn't true.